This is a personal admiration note of who was one of the best Colombian researchers and although micropaleontology was his strong field also ventured into other fields of geology, as evidenced by his works. Hermann Duque Caro, geologist, stratigrapher and micropaleontologist born in Bogotá, Colombia on March 22, 1935. Lover of classical music, fine wines and great interpreter of the violin was raised in a renowned family of the Colombian capital. Since his childhood he focused his interest in the natural sciences getting his undergraduate degree in Geology and Geophysics at the National University of Colombia in Bogotá in 1959, later completed postgraduate studies in the United States, his Masters in Geology with an emphasis on Micropaleontology and Stratigraphy at Columbia University, 1962; Phd. Princeton University, 1991. 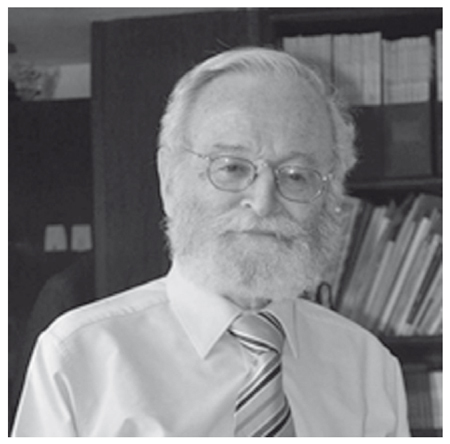 He worked for the Instituto de Investigaciones en Geología y Minería de Colombia (INGEOMINAS) for about 30 continuous years, he combined his time with internships in scientific events related to geological studies in the United States Geological Survey, the Smithsonian Institution in Washington and as professor at the Universidad Nacional de Colombia in Bogota, participating actively in scientific events related to geological studies of the Caribbean and northern South America and as part of the Editorial board of several journals in the field of Geosciences. After his retirement he worked as a consultant for various companies in geological studies and stratigraphic of most basins in the country. I had the opportunity of sharing with him big part of his career; when I entered at the INGEOMINAS to do my undergraduate thesis and although my supervisor was Dr. Fernando Etayo Serna, the counselor in the moments of distress was Dr. Herman Duque Caro; then with his guide in the 90s I had the opportunity to know the geology of the Colombian Caribbean coast, especially mapping the map 38 of the Carmen de Bolivar, chosen by the same Dr. Duque as one of the areas where oil companies had defined several geological units in northern Colombia; those were pleasant days learning about the rocks that integrate the geology of this region and listening to their experiences with micropaleontology and his forays into the geology of the Guajira. At the same time of being a great expert of micropaleontology of the northern South America and all the Caribbean islands, he made efforts not only in the good preparation of the samples but also with the execution and aesthetic of the microplate; when he was concentrated in his work and also listening to classical music or pieces for violin, I dared to think their microplates were artworks in miniature, like musical scores written with tiny letters. He enjoyed a healthy and harmonious life. Jairo Alexander Duarte remembers him not only as a brilliant scientist but as a great human being, he is thankful for his guidance in his undergraduate work where he could have a personalized training but also strict with issues related to the study of foraminifera and its application to the resolution of regional geological problems. The afternoons were enriched with social gatherings where besides the usual "thesis" corrections were time for discussion of many topics of general culture, particularly his soccer and St. Augustine philosophy. Dr. Duque always showed a passion for geology and micropaleontology, a 10 minutes chat with him could inspire any colleague and thus have certainty and confidence that you have chosen the right career. José Hermann Duque Caro was a strict person at the scientific level and a good talker, always ready to give the best of himself and supportive with all the "students" who went to his consulting office with questions and doubts, those values highlighted him as well as his fervent love for his wife Mrs. Bertha Nope de Duque. He died on September 20 of 2015, leaving a deep imprint in the hearts of all who knew him, not only for his prolific and scientific legacy, but especially for his generosity, friendship and work human warmth.